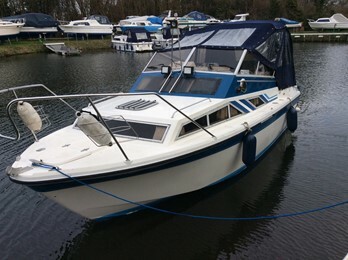 A classic sports cruiser from Fairline with elevated cockpit for better vision. The Fairline Holiday was the most popular craft to date built by Fairline with over 590 boats built. This semi displacement deep V hull with rounded shallow transom section was designed by John Bennett. The design produced a craft suitable for inland and sheltered coastal use. The interior design offers 2 conventional V berths to the bow section with 2 further berths extending aft under the cockpit. This was one of the first designs of cruiser with an elevated cockpit height giving good cruising versions. Some craft have been re-engined over the years. The mk1 and mk2 models were slightly smaller at 22ft 1in/6.73m in length and 8ft 6ins/2.59m beam.